I've been waiting anxiously for my hellebores to start blooming and it finally happened last week! The Lenten Rose or Hellebore, Helleborus orientalis, is one of my absolute favorite cut flowers. The muted colors are just absolutely gorgeous! I dream of spring when this flower is in season and I'm so glad I finally got some planted in my garden last spring. Missouri Botanic Garden lists Helleborus orientalis as a clump-forming, late winter-blooming perennial which typically grows 1-1.5' tall. It features large, cup-shaped, rose-like, usually nodding flowers (3-4" diameter) with center crowns of conspicuously contrasting yellow stamens. Flowers usually appear in clusters of 1-4 on thick stems rising above the foliage. Flower color is extremely variable, ranging from white to pink to light rose-purple, frequently with interior spotting, which I love! Read the full plant listing here. It's a small plant, so site plants near a kitchen window, patio or walkway so that the early bloom may be enjoyed to the fullest. 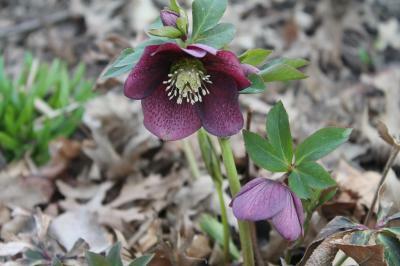 the Lenten Rose has several great uses including grouping in shady locations under trees or large shrubs, woodland gardens or border fronts. It may also be incorporated into a naturalized area where clumps will slowly spread through self-seeding or could be massed to form an attractive ground cover. 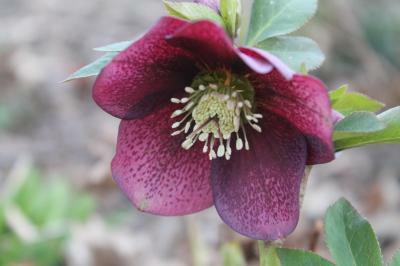 According to University of Illinois Extension, hellebores can be slow to establish but are long lived once they do. They prefer high organic matter soils that are moist and in a shaded location. Another nice feature is that the foliage tends to be evergreen and gardeners have reported this perennial to be deer and rabbit resistant.Learn more here. 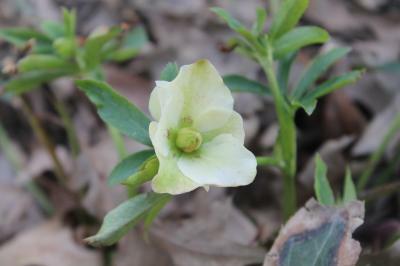 Check out Helleborus niger as well which is an even earlier blooming Hellebore. Blooms in February-March!